London Olympic organizers have apologized to the North Korean women’s football team after their images were shown on a screen beside a South Korean flag. Kick-off at Glasgow’s Hampden Park on the first day of the Games’ sporting action was delayed for about an hour. The men’s football competition gets under way with eight games later, including Britain v Senegal at Old Trafford at 20:00 BST. The penultimate day of the torch relay sees the flame visit Buckingham Palace. The flag mix-up at Hampden Park had been an “embarrassing mistake” and not the start Games organizers would have wanted, but “no great harm was done”. 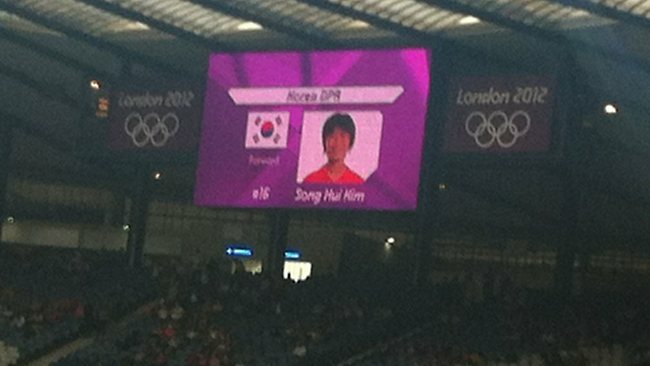 As the North Korean players were being introduced before the match against Colombia, South Korean flags were mistakenly displayed in the video package. The squad walked off and could only be persuaded to return when the teams were announced again with each player’s face displayed next to the North Korean flag. Relations between the two Koreas are tense – they remain technically at war following the 1950-53 Korean conflict, which ended in an armistice. It was not immediately clear who had produced the video shown in the stadium. The opening match in the men’s football gets under way at 12:00 BST at Hampden Park when Honduras take on Morocco, followed by Spain v Japan. Matches are also taking place at St James’ Park in Newcastle, Cardiff’s Millennium Stadium and the City of Coventry Stadium.